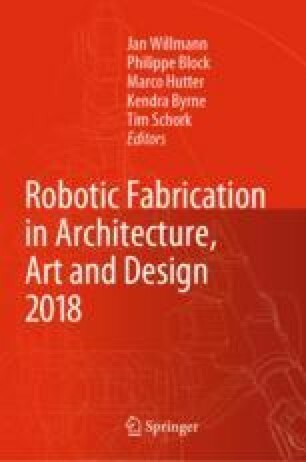 This paper presents methods and techniques to robotically prefabricate timber frame modules. The key challenge of this research lies in enabling the digitally informed and fabricated spatial assembly of timber beams into prefabricated timber frame modules. The project combines the fabrication and the spatial assembly of timber beams into one fully integrated robotic fabrication process. A cooperative robotic construction procedure that minimises the need for scaffolding and allows for the informed assembly of spatial structures with non-planar geometries was developed. This required the examination of suitable timber joining methods, assembly sequencing, as well developing appropriate and novel strategies to register and handle material deviations and construction tolerances. The physical implementation of the research in multiple experiments and finally, a full-scale building project validates the approach. This research project is a result of an interdisciplinary collaboration between a team from ETH Zurich and the industrial partner ERNE AG Holzbau. The authors thank the other involved team members including Augusto Gandia, Gonzalo Casas, Matteo Pacher, Moritz Späh, Dr. Thomas Kohlhammer, Dr. Volker Helm, Dr. Ammar Mirjan and Aleksandra Anna Apolinarska from Gramazio Kohler Research, Chair of Architecture and Digital Fabrication at ETH Zurich. They also thank Michael Lyrenmann, Philippe Fleischmann and Lukas Stadelmann from the Robotic Fabrication Laboratory, ETH Zurich. This research project is supported by the Institute of Technology in Architecture at ETH Zurich, NCCR Digital Fabrication, ERNE AG Holzbau and a Commission for Technology and Innovation CTI grant.